You'll be £11.39 closer to your next £10.00 credit when you purchase The AMX 13 Light Tank. What's this? Being a light tank it was an ambitious and far sighted departure from conventional tank design and it found a ready export market as well as being a critical part in the French Army arsenal. Its basic hull design lent itself to the development of a vast list of variants. French designers progressively modernised, and indeed reinvented, the AMX13 and enabled it to claim to be one of the most successful armoured vehicle programmes of the post-war period. It proved its worth in numerous small wars worldwide in the service of many countries. The excellent text is complimented by a splendid collection of high-quality photographs, and while there isn't a walk-around section per se, there are more than sufficient shots of the vehicle to provide modellers with all the reference material they require, especially for diorama builders. This book has a great selection of images from both official and private collections. It will appeal strongly to historians, modellers and collectors. 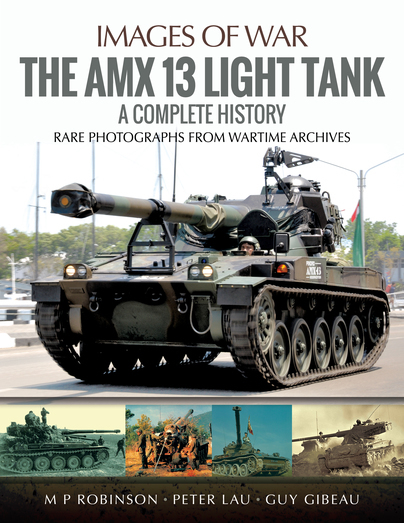 Whilst the AMX 13 is a well-known tank in general terms, there has, until now, been a gap in tank knowledge. This book addresses this gap by expertly guiding the reader from the development of the tank to production, modification and service. Overall, this relatively short volume is an absolute must for anyone seriously interested in French tanks. A great book for anyone who is interested in this amazing innovation in tank design! Buy this collection facts put together by the experts! Informative text in each chapter is supported by plenty of archive photos, and a mix of black and white archive images alongside more modern colour images. All have comprehensive captioning and they do include the fascinating line up of examples of the AMX series which can be found at the French Musee des Blindes at Saumur. A very useful addition to the Images of War series, and a fitting tribute to Guy Gibeau I felt. The late Lieutenant-Colonel Guy Gibeau was a mechanized infantry officer whose career in the French Army spanned four decades. Much of his early career was spent in command of AMX13 series vehicles, and he was one of France's foremost experts on the type. He died in 2017. Peter Lau is a Product Manager responsible for the life cycle support of a main battle tank. He has served in an armoured battalion in the Singapore Army and is the author of two books on the AMX13 Mle 51 Light Tank.